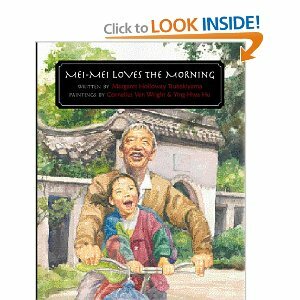 Perfect way to start a morning – help your children compare Mei-Mei’s morning to theirs. If your child has grandparents, how can you encourage them to do activities together – even if there are many miles apart? Talk about tai-chi and other forms of gentle body-mind exercise – try it with your child! What types of birds do people keep for pets? The array of food during my stay in Singapore was FANTASTIC. But I woke up in the middle of the night on the day before I was to leave, and felt really ill. When I came down to the breakfast buffet at the hotel, wise Susanne Gervay suggested that I eat only RICE PORRIDGE and a little dry toast. 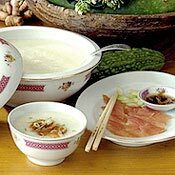 Fortunately, rice porridge was served as part of the buffet and it did the trick! I was totally fine for the 36-hour flights home the next day! What do you and your children have for breakfast? In my Show Me How book, there are many yummy breakfast recipes…double apple pancakes, banana bran muffins, muesli, breakfast granola, oatmeal, blueberry muffins, wildly spiced apple muffins and egg-in-a-nest (my husband’s all-time favorite!). Is the pace at home a little slower during the summer? Invite your young children to help in the kitchen – they love measuring and pouring and mixing! It’s fun and educational for them – and if you have a fussy eater, helping to prepare the food might encourage him to try new things. 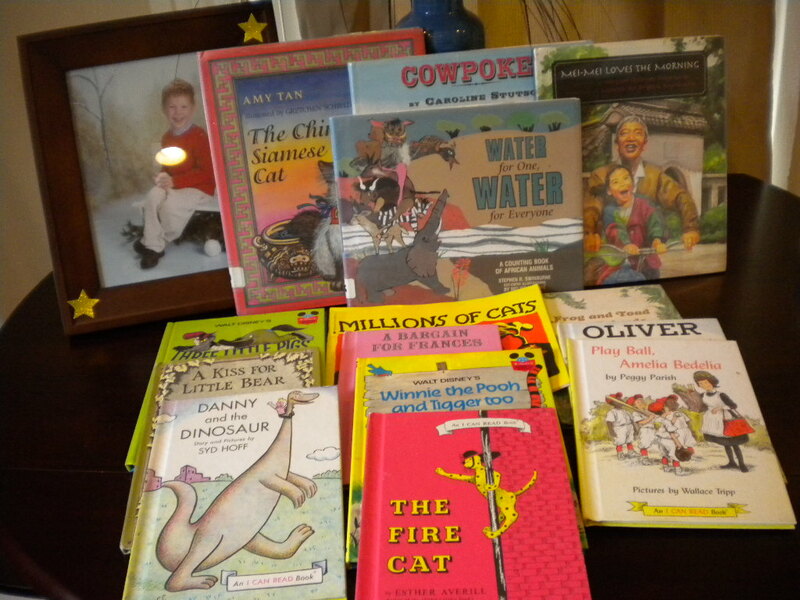 This entry was posted in Multicultural Books, Picture Book Review, recipes, Summer activities for kids and tagged Cantonese rice porridge, Children's literature, Cornelius Van Wright, Grandparent, Margaret Holloway Tsubakiyama, Mei-Mei Loves the Morning, Multicultural picture book review, New Hampshire, Show Me How! Build Your Child's Self-Esteem Through Reading, Singapore, Summer activties for kids, Susanne Gervay, Ying-Hwa Hu by viviankirkfield. Bookmark the permalink. What a beautiful story to help kids understand the customs and daily routines of kids in other countries. I love your find. I wondered why you just didn’t buy the books for Jake and leave them with him. He will certainly have a ball with them. I’m finishing a multicultural YA novel that’s excellent. Have read a number of books the summer I have a hard time getting to them during the year. Summer is a perfect time to catch up on reading…I agree! You got some terrific buys on the books, Vivian, and you showed more restraint that I could have shown. Yes…but only because I knew I would have to be lugging them on flights. Normally, I would not have been able to resist. :) And now that we know we will be moving there in the near future, I have gazillions of books to go thru of my own and my husbands…I’ve already brought over a hundred to the friends of the library. With great deals comes great restraint! 😉 We would’ve driven to New Hampshire, so I could by the box of books for $2 (if I had $2 😉 )! I would love to be where you are, buying books at 25cents!